You know what I consider the three most dangerous words in the English dictionary when I’m trying to learn something? It’s the phrase I hear most often when you tell someone a method that absolutely works – but it’s not what they want to hear. Do you have a good guess yet? 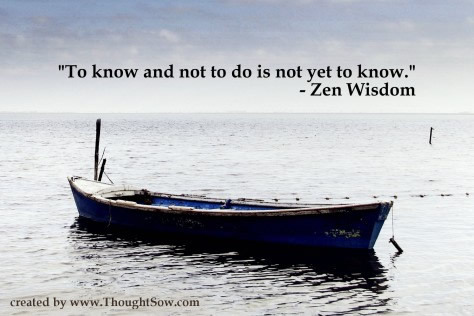 The whole point is that at the end of the day, we may all “know” what to do, but until we apply that knowledge, we don’t know anything. It’s the application of knowledge that gives it, it’s power. So the next time you catch yourself asking for advice and then saying, “Yeah, I know,” Stop! Catch yourself and ask, “Have I gave this method a fair shot or can I simply recite moot facts without any real world experience behind that ‘I know’ statement?” If you haven’t given the method a fair shot, try to implement what you “know” over the next 30 days. By moving past simply hearing the advice, to actually applying that which you “know,” you allow yourself the opportunity to finally learn and gain wisdom. That wisdom is usually invaluable. If you go on a diet – try it out for 30 days. No BS, no justifications or excuses. Stick it out. It may not work indefinitely, but you’ll learn what your limiting factors are and what you truly struggled with. If you’re going to try a workout routine or program, follow the damn directions. Don’t make changes here and there to suit your needs. Programs designed are typically designed to illicit certain responses. By making random changes, you start to negate those responses. AFTER you’ve done the program as prescribed, then make changes. But don’t make those changes until you’ve put in the work. The bottom line is, only when you apply that which you “know” will you ever truly learn and move closer towards your goals. If you don’t want to hear someone repeat something you already know, then don’t ask the person in the first place.